Development of vertebrate jaws involves patterning neural crest-derived mesenchyme cells into distinct subpopulations along the proximal-distal and oral-aboral axes. Although the molecular mechanisms patterning the proximal-distal axis have been well studied, little is known regarding the mechanisms patterning the oral-aboral axis. Using unbiased single-cell RNA-seq analysis followed by in situ analysis of gene expression profiles, we show that Shh and Bmp4 signaling pathways are activated in a complementary pattern along the oral-aboral axis in mouse embryonic mandibular arch. Tissue-specific inactivation of hedgehog signaling in neural crest-derived mandibular mesenchyme led to expansion of BMP signaling activity to throughout the oral-aboral axis of the distal mandibular arch and subsequently duplication of dentary bone in the oral side of the mandible at the expense of tongue formation. Further studies indicate that hedgehog signaling acts through the Foxf1/2 transcription factors to specify the oral fate and pattern the oral-aboral axis of the mandibular mesenchyme. Formation of the jaws conferred a huge evolutionary advantage to the early vertebrates such that more than 99% of living vertebrates today have biting jaws as a primary feeding apparatus (Brazeau and Friedman, 2015; Janvier, 1996; Miyashita, 2016). Central in the formation and evolution of the vertebrate jaws is the embryonic first pharyngeal arch, the rostral-most pharyngeal arch recognized in the embryo (Cerny et al., 2004; Kuratani, 2004; Kuratani, 2012; Miyashita, 2016). Whereas all of the pharyngeal arches form by cranial neural crest cells that populate between the embryonic foregut endoderm and ventral surface ectoderm, and although neural crest cells populating each of the other pharyngeal arches are specified by a combination of colinearly expressed Hox genes, the neural crest cells populating the first arch are Hox-negative and their fates are primarily regulated by signaling molecules expressed in the arch epithelium (Minoux and Rijli, 2010; Miyashita, 2016; Trainor and Krumlauf, 2001). As has been demonstrated by cell lineage studies in both axolotl and chick embryos, neural crest cells in the dorsal portion of the first pharyngeal arch contribute to trabecular bones of the neural cranium whereas neural crest cells in the ventral portion of the first arch, referred to as the mandibular arch, give rise to skeletal elements of both the upper and lower jaws (Cerny et al., 2004; Kuratani et al., 2013). In addition to giving rise to the skeletal structures of the jaws, which form in the aboral regions of the maxillary and mandibular prominences (Cobourne and Sharpe, 2003), the neural crest-derived ectomesenchyme cells interact with the oral epithelium to form teeth as well as to organize tongue formation at the oral side of the mandible (Cobourne and Sharpe, 2003; Lumsden, 1988; Mina and Kollar, 1987; Parada and Chai, 2015). Whereas previous studies have uncovered detailed molecular mechanisms patterning the rostral-caudal and proximal-distal axes of the jaw skeleton (Medeiros and Crump, 2012; Minoux and Rijli, 2010), the molecular mechanism patterning the oral-aboral axis of the mandibular arch mesenchyme is not well understood. Upon arriving in the mandibular arch, the neural crest cells encounter a wealth of epithelial signals, including Fgf8 and Bmp4 expressed by the facial ectoderm as well as Shh expressed by the pharyngeal endoderm (Brito et al., 2006; Haworth et al., 2004; Haworth et al., 2007; Jeong et al., 2004; Shigetani et al., 2000; Tucker et al., 1998; Tucker et al., 1999). Both Fgf8 and Shh signaling are crucial for the survival and proliferation of the neural crest cells colonizing the mandibular arch (Brito et al., 2006; Creuzet et al., 2004; Jeong et al., 2004; Trumpp et al., 1999). Fgf8 and Bmp4 act to pattern the proximal-distal axis of the mandibular arch by activating expression of distinct homeodomain-containing transcription factors in the neural crest-derived mandibular mesenchyme, including Barx1 expression in the proximal region and Msx1 and Msx2 in the distal region (Barlow et al., 1999; Ferguson et al., 2000; Tucker et al., 1998). In addition, it has been shown that restricted expression of the Lim-homeobox domain genes Lhx6 and Lhx8 (previously called Lhx7) in the rostral region of the mandibular mesenchyme depends on Fgf8 signaling from the mandibular ectoderm (Cobourne and Sharpe, 2003; Grigoriou et al., 1998; Tucker et al., 1999). Since Lhx8 mRNA expression was found restricted in the rostral region of the mandibular arch mesenchyme on frontal sections, the authors interpreted the rostral side of the mandibular arch as the oral side and suggested that Fgf8 signaling might be important in patterning the oral-aboral axis of the mandible (Cobourne and Sharpe, 2003; Grigoriou et al., 1998; Tucker et al., 1999). However, tissue-specific inactivation of Fgf8 in the early mandibular arch epithelium in the mouse embryos caused complete loss of proximal mandibular structures (Trumpp et al., 1999), which proved that Fgf8 signaling is essential for proximal mandibular development but whether Fgf8 signaling is required for patterning the oral-aboral axis remains unresolved. Recent development of the single cell RNA-seq (scRNA-seq) technology allows simultaneous profiling of the transcriptomes of thousands of individual cells from an organ or tissue in a single experiment and is revolutionizing many areas of biology and disease research (Klein et al., 2015; Macosko et al., 2015; Park et al., 2018; Rosenberg et al., 2018; Tirosh et al., 2016; Venteicher et al., 2017; Zheng et al., 2017). In addition to identifying novel cells as well as uncovering new marker genes for previously defined cell types within both healthy and diseased tissues (Klein et al., 2015; Park et al., 2018; Rosenberg et al., 2018; Tirosh et al., 2016; Venteicher et al., 2017; Zheng et al., 2017), scRNA-seq has enabled effective generation of high resolution molecular atlases of the gene expression programs that drive tissue and organ morphogenesis (Adam et al., 2017; Park et al., 2018; Rosenberg et al., 2018). In this study, we performed scRNA-seq analysis of E10.5 mouse mandibular arch. Unbiased clustering analysis of more than 10,000 cells from the E10.5 mandibular arch confirms the compartmentalized expression of major signaling molecules, including Bmp4, Fgf8, Shh, Wnt6, in the mandibular epithelium and spatially-restricted target gene expression in the mandibular arch mesenchyme. Whereas previous reports of whole mount in situ hybridization data showed restricted expression of several Bmp and Shh target genes in the distal mandibular mesenchyme at this developmental stage (Jeong et al., 2004; Liu et al., 2005), our scRNA-seq data revealed that these two pathways are activated in complementary subdomains in the distal mandibular arch mesenchyme. 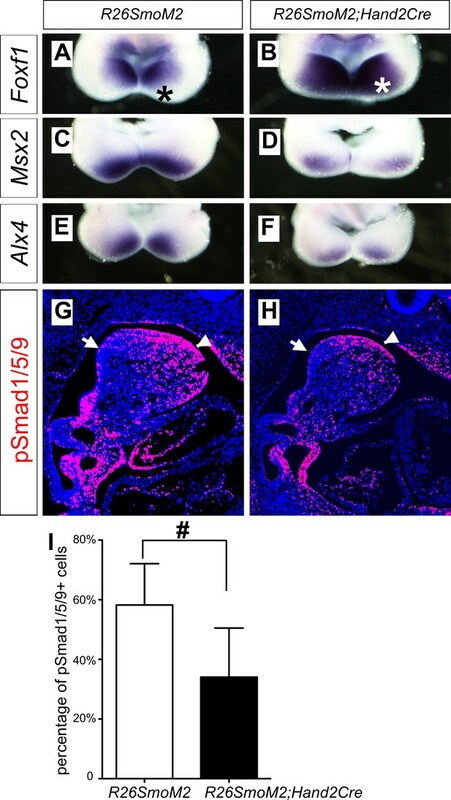 Subsequent in situ hybridization analysis validated these findings and revealed that expression of Shh and Bmp4 target genes are patterned along the oral-aboral axis. Furthermore, we show that tissue-specific inactivation of Smo, which encodes an obligatory and cell-autonomous transducer of hedgehog signaling (Briscoe and Vincent, 2013; Jeong et al., 2004; Zhang et al., 2001), in the distal mandibular arch mesenchyme led to duplication of the dentary bone in the oral side of the mandibular mesenchyme at the expense of tongue formation. In the absence of Smo function, BMP signaling is activated throughout the oral-aboral axis of the distal mandibular arch mesenchyme. Moreover, we show that tissue-specific inactivation of Foxf1 and Foxf2 in the cranial neural crest cells also led to agenesis of the oral tongue structure and ectopic bone formation in the oral side of the mandible. These results uncover a previously unknown molecular mechanism involving antagonistic actions of hedgehog and BMP signaling in patterning the oral-aboral axis of the mandible. To gain better understanding of the gene expression programs driving mandibular morphogenesis, we performed scRNA-seq analysis of E10.5 mouse mandibular arch using the 10x Genomics’s Chromium Single Cell system (see Materials and methods). After filtering at both cell and gene levels using highly stringent criteria (see Materials and methods), we obtained high quality transcriptome profiles of 10,586 cells, which expressed 17,074 unique genes, with the median number of detected genes and transcripts at 2624 and 8824, respectively. The unsupervised clustering of the scRNA-seq data generated the cell groupings shown in a two-dimensional t-distributed Stochastic Neighbor Embedding (tSNE) plot in Figure 1A. All major cell types were identified and validated by the expression of known cell type selective markers. The transcriptome signature gene list for the cell clusters are shown in Supplementary file 1 and the gene expression profiles summarized in a heatmap in Figure 1—figure supplement 1. As expected, the majority of the cells were of neural crest origin, accounting for over 9000 of the 10,586 cells and are distributed in two subgroups, NC1 and NC2, representing cells in the proximal (expressing Barx1) and distal (expressing Hand2) regions of the E10.5 mandibular arch, respectively. About 8% of the cells were epithelial cells, which are marked by expression of Epcam (830 cells, including both endoderm and ectoderm cells). The endothelial cells (234 cells, marked by Pecam1 expression) and other mesoderm-derived cells (249 cells) were also grouped according to their cell type identity. The NC3 cluster, consisting of 484 cells, is distinguished from the other clusters primarily by overall lower levels of transcripts and dramatically lower number of genes detected per cell (Figure 1—figure supplement 2 and Figure 1—figure supplement 3, and Supplementary file 2). In addition, the NC3 cluster cells showed very low levels or absence of several ubiquitously expressed, nuclear localized long noncoding RNAs, including Malat1, Xist, Meg3, and Kcnq1ot1 (Supplementary file 2, Figure 1—figure supplement 4). These data suggest that the NC3 cluster resulted, most likely, from incomplete lysis of a subset of single cells. Analysis of scRNA-seq data of E10.5 mouse mandibular arch. (A) tSNE plot of all cells with high quality RNA-seq results shows clustering of the major cell types. (B) Unsupervised clustering of the neural crest-derived mandibular mesenchyme cells shows six identifiable subgroups. 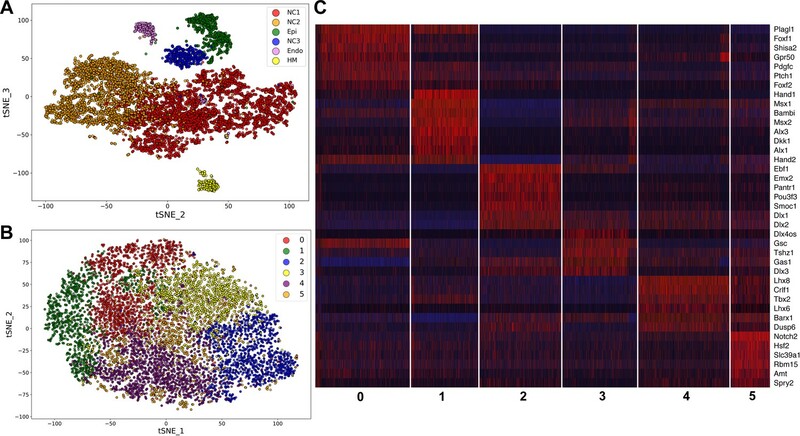 (C) Heat map showing distribution of cells in the six subgroups shown in B, with selected marker genes exhibiting more than 1.3-fold difference in expression levels across all six subgroups. The cluster numbers are marked at the bottom of Panel C and correspond to the cluster numbers in Panel B. The expression level for each marker gene in the individual cells is reflected by color of the vertical bars, with bright blue being lowest and bright red being highest. We performed iterative clustering analysis of the neural crest cell populations from NC1 and NC2 clusters shown in Figure 1A, which further grouped the neural crest-derived mandibular mesenchyme cells into six subgroups. Over/under clustering was verified via gene expression heatmaps. A 3D tSNE projection of these neural crest cell subgroups is shown in Figure 1—video 1 and a 2D tSNE projection is shown in Figure 1B. A list of highly differentially expressed marker genes of each of the six clusters is provided in Supplementary file 3. Subgroups 0 and 1 share high levels of expression of Hand2, a marker of the distal domain of the mandibular arch mesenchyme at this developmental stage, whereas Subgroup 2 lacks Hand2 expression and instead expresses the proximal domain marker genes Emx2 and Pou3f3 at high levels (Figure 1C). Subgroups 3 and 4 appear to distribute along the rostral-caudal axis, with Subgroup 3 expressing high levels of the caudal domain marker gene Gsc and with Subgroup 4 expressing high levels of the rostral domain marker genes Lhx8 and Lhx6 (Figure 1B,C). Subgroup 5 cells are more scattered than the other subgroups in the tSNE plot but are uniquely marked by high levels of expression of Notch2 (Figure 1B,C, Supplementary file 3). Whereas it is remarkable that the iterative clustering analysis of the scRNA-seq data grouped the mandibular neural crest mesenchyme cells into subgroups that occupy distinct spaces along the proximal-distal and rostral-caudal axes, most of the marker genes are not exclusively expressed in only one subgroup and there was no sharp boundary between the adjacent subgroups (Figure 1B,C, Supplementary file 3). Nevertheless, the cellular distributions in the tSNE plot correlated well with their spatial patterns of gene expression along the proximal-distal and rostral-caudal axes of the mandibular arch in the intact embryo (Figure 2). Moreover, although both Subgroups 0 and 1 consist of neural crest cells from the distal region of the mandibular arch mesenchyme marked by high Hand2 expression, they are distinguished from each other by significant differential expression of multiple genes (Figure 1C, Supplementary file 3). Strikingly, several Hedgehog signaling target genes, including Ptch1, Foxf1, and Foxf2, were among the top marker genes for Subgroup 0 whereas several BMP signaling target genes, including Msx1, Msx2, and Bambi were among the top markers for Subgroup 1. Visualization of the 3D tSNE projection of all six neural crest cell subgroups suggest that Subgroups 0 and 1 are distributed along a distinct axis from Subgroups 2 and 3. Furthermore, gene ontology analyses showed ‘skeletal system development’, ‘ossification’, and ‘osteoblastic differentiation’ among the enriched biological processes for both Subgroups 0 and 1 (Supplementary file 4 and 5). These results suggest that the molecular pathways patterning Subgroups 0 and 1 maybe responsible for patterning the oral-aboral axis of the mandibular arch. Distribution of E10.5 mandibular arch cells expressing select marker genes in the neural crest compartments in tSNE maps. (A–D) Cells expressing Pou3f3 (A), Dlx5 (B), Hand2 (C), and Hand1 (D) in the neural crest cell population, detected by scRNA-seq, are shown in red color in tSNE plot, with the brightness of the red color corresponding to levels of transcripts detected. (E–H) Rostral views of the mandibular arches of E10.5 mouse embryos showing patterns of expression of Pou3f3 (E), Dlx5 (F), Hand2 (G), and Hand1 (H) mRNAs detected by whole mount in situ hybridization. Green dots mark the oropharyngeal and aboral sides of the mandibular arches, with the distal caps of the paired mandibular arches meeting at the midline. (I, J) Cells expressing Lhx8 (I), and Gsc (J) in the neural crest cell population, detected by scRNA-seq, are shown in red color in tSNE plot. (K, L) Frontal views of the mandibular arches of E10.5 mouse embryos showing patterns of expression of Lhx8 (K) and Gsc (L) mRNAs detected by whole mount in situ hybridization. mn, mandibular process; mx, maxillary process. In addition to clustering analyses and visualization of the scRNA-seq data in 2D and 3D tSNE projections, we also analyzed significant principal components determined by JackStraw plot but the principal component analysis did not clearly distribute the neural crest cells along the major spatial axes (Figure 1—figure supplement 5 and Figure 1—figure supplement 6). We also analyzed the developmental trajectories of all of the neural crest cells using Monocle-2 (Qiu et al., 2017), which distributed the mandibular arch mesenchyme into five different states (Figure 1—figure supplement 7). However, GO analysis showed that only States 3 and 4 showed enrichment for cell type differentiation, with State 3 significantly enriched for ‘osteoblast differentiation’ (Supplementary file 6) and State 4 enriched for ‘neuron differentiation’ (Supplementary file 7). State 3 contains only a small subset of the mandibular arch mesenchyme cells that are widely scattered on the tSNE plot (Figure 1—figure supplement 8). Altogether, the unsupervised iterative clustering analysis of the scRNA-seq data with 3D tSNE projections provided the highest resolution to distribute the mandibular arch single cells into subgroups along three major spatial axes. To verify whether the Hedgehog and BMP signaling pathways are activated in a complementary pattern along the oral-aboral axis in the mandibular arch mesenchyme in vivo, we performed in situ hybridization and immunofluorescent staining analysis to directly compare the patterns of gene expression along the oral-aboral axis of the E10.5 mandibular arch. Previous studies of gene expression patterns in the developing craniofacial tissues in mouse or chick embryos often presented the data in frontal views of the embryonic facial prominences, which provide clear visualization of gene expression patterns along the proximal-distal and rostral-caudal axes of the mandibular arch (Figure 3A–D) but have rarely directly compared patterns of gene expression along the oral-aboral axis. For examining whole mount in situ hybridization data, we found that removing the frontonasal and maxillary regions and looking directly down at the mandibular arches of E10.5 mouse embryos, but not the frontal views of the embryonic mandible, provided clear visualization of the patterns of gene expression along the oral-aboral axis of the mandibular arch (Figure 3A–P). We further validated the patterns of gene expression along the oral-aboral axis by section in situ hybridization assays. Consistent with previous reports from studies of chick embryos (Brito et al., 2008; Haworth et al., 2007), we found that Shh mRNA expression in the mandibular arch epithelium is restricted to the oropharyngeal side at E10.5 (Figure 3E and E’). Corresponding to this restricted Shh expression pattern, expression of Ptch1, Foxf1, and Foxf2, known transcriptional target genes of hedgehog signaling (Hoffmann et al., 2014; Jeong et al., 2004), is restricted to the oropharyngeal side of the mandibular arch cells underneath the Shh-expressing epithelium (Figure 3F–H and Figure 3F’–H’). Whereas Bmp4 and Fgf8 mRNAs are expressed in the distal and proximal regions of the oral ectoderm (Figure 3I,I’, M,M’, N,N’), respectively, the down-stream target genes of BMP signaling, including Msx1, Msx2 and Alx4, are expressed in an aboral-to-oropharyngeal gradient pattern complementary to that of Foxf1 and Foxf2 in the distal mandibular arch mesenchyme (Figure 3J–L, and Figure 3J’–L’, compare with Figure 3G’–H’). In contrast, the Lhx8 and Lhx6 mRNAs are expressed in a limited region of the rostral mandibular mesenchyme underlying the Fgf8 expressing epithelium (Figure 3O–P and Figure 3O’–P’). These results demonstrate clearly that the rostral-caudal axis of the mandibular arch mesenchyme along which the Fgf8-Lhx6/8 pathway is activated is distinct from the oral-aboral axis along which the Hedgehog and BMP signaling pathways exhibit complementary activity in the mandibular arch mesenchyme. These results also highlight the clarity of visualizing differential gene expression patterns along the oral-aboral axis using sagittal sections and the limitation of frontal views (compare Figure 3B,C with Figure 3G,K) or frontal sections for analysis of gene expression patterns in the developing facial processes. Expression of Shh, Bmp4, Fgf8, and their target genes in the developing mandibular arch. (A–C) Frontal views of E10.5 embryonic mouse heads after whole mount in situ hybridization detecting Fgf8 (A), Msx1 (B) and Foxf1 (C). Green dashed lines mark the rostral and caudal sides of the embryonic mandibular arch. (D) A schematic indication of the proximal-distal and rostral-caudal axis of developing mandibular arch in the frontal view. (E–P) Rostral views of the mandibular arches in E10.5 mouse embryos showing patterns of expression of Shh (E), Ptch1 (F), Foxf1 (G), Foxf2 (H), Bmp4 (I), Msx1 (J), Msx2 (K), Alx4 (L), Fgf8 (M, N), Lhx8 (O), and Lhx6 (P) mRNAs. The red vertical line in Panel E shows approximate position of sagittal sections selected for in situ hybridization detection on sections. The orientation of the oral (o) and aboral (a) axis is also indicated in Panel E. Note the complementary pattern of Foxf1 and Msx1 expression along the oral-aboral axis in G and K that could not be distinguished on the frontal views in B and C. (E’–P’) Sagittal sections showing expression of Shh (E’), Ptch1 (F’), Bmp4 (I’), Msx1 (J’), Msx2 (K’), Alx4 (L’), Fgf8 (M’, N’), Lhx8 (O’), Lhx6 (P’) mRNAs, and Foxf1 (G’) and Foxf2 (H’) proteins in the distal mandibular arch in E10.5 mouse embryos. Protein immunofluorescence is shown in red color in G’ and H’, whereas mRNA signals in all other panels are shown in purple/blue color. Arrow points to oropharyngeal endoderm, and arrowhead points to aboral ectoderm. The red and yellow lines in (M) and (N), respectively, indicate the different positions corresponding to the sections in (M’) and (N’). To investigate whether hedgehog signaling plays a direct role in patterning the mandibular arch mesenchyme along the oral-aboral axis, we first examined Smoc/c;Wnt1-Cre mouse embryos in which Smo, the obligatory and cell-autonomous transducer of hedgehog signaling (Briscoe and Vincent, 2013; Jeong et al., 2004; Zhang et al., 2001), is inactivated in all cranial neural crest cells (Danielian et al., 1998; Jeong et al., 2004). Similar to the phenotype of Smoc/n;Wnt1-Cre mice (Smon is a Smo-null allele) as previously reported (Jeong et al., 2004), the Smoc/c;Wnt1-Cre mice die perinatally and exhibit severe truncation of facial structures, including the maxilla and mandible (Figure 4A–B), and agenesis of the oral tongue tissues (Figure 4—figure supplement 1). Examination of the mandibular skeleton in E18.5 mouse embryos showed that the Smoc/c;Wnt1-Cre mutants had mirror-image duplication of the dentary bone, including duplication of the condylar process, although the mandibular skeleton is distally truncated (Figure 4C–D). A similar partial duplication of the dentary was reported in the Smoc/n;Wnt1-Cre mutants (Jeong et al., 2004) but the tissue source of the duplicated dentary bone was not investigated. We analyzed coronal sections of E13.5 Smoc/c;Wnt1-Cre embryos and their littermates and found that the Smoc/c;Wnt1-Cre embryos had ectopic ossification in the oral side of the mandibular mesenchyme where the tongue failed to form, as indicated by ectopic expression of Runx2 and alkaline phosphatase in the oral side of the mandibular mesenchyme (Figure 4E–H). These results suggest that hedgehog signaling in the neural crest cells is required for proper specification of the oral side of the mandibular mesenchyme. Smoc/c;Wnt1-Cre embryos display tongue agenesis and ectopic ossification. (A, B) Lateral view of skeletal preparations of heads of E18.5 Smoc/c (A) and Smoc/c;Wnt1-Cre (B) embryos (n = 3 for each genotype). (C, D) Comparison of the mandibular skeletons of E18.5 Smoc/c (C) and Smoc/c;Wnt1-Cre (D) embryos (n = 3 for each genotype). Arrows in D point to condylar cartilage and the arrowheads point to the duplicated dentary bone. Asterisk in D indicates truncation of the distal mandible in Smoc/c;Wnt1-Cre embryos. (E, F) Immunofluorescent detection of Runx2 protein (red) on frontal sections of E12.5 Smoc/c (E), and Smoc/c;Wnt1-Cre (F) embryos (n = 3 for each genotype). Sections were counterstained with DAPI. (G, H) Detection of alkaline phosphatase activity (blue) on frontal sections of E13.5 Smoc/c (G) and Smoc/c;Wnt1-Cre (H) embryos (n = 3 for each genotype). Arrowheads in F and H point to the ectopic ossification at the oral side of mandibular mesenchyme. The condensed Meckel’s cartilage primordia are outlined using dashed lines in G and H. p, palate; t, tongue. We compared the patterns of expression of the BMP target genes Msx1, Msx2, and Alx4 in the Smoc/c;Wnt1-Cre mutant embryos and their control littermates. We found that expression of Msx1, Msx2, and Alx4 mRNAs were all expanded to the oropharyngeal side of the distal mandibular arch mesenchyme in the Smoc/c;Wnt1-Cre mutant embryos by E10.5 (Figure 4—figure supplement 2), suggesting that hedgehog signaling might specify oral fate of the mandibular mesenchyme through antagonizing BMP signaling. It has been reported that the Smoc/n;Wnt1-Cre mouse embryos had significantly increased apoptosis of neural-crest derived facial mesenchyme, including mandibular arch mesenchyme at E9.5 to E10.5 (Jeong et al., 2004). One possible explanation of the dentary bone duplication and altered patterns of gene expression we have observed in the Smoc/c;Wnt1-Cre mutant embryos is that those defects might be secondary to altered neural crest migration and/or cell death caused by lack of hedgehog signaling in the migrating neural crest cells. To investigate further whether hedgehog signaling plays a direct role in oral-aboral patterning of the mandibular mesenchyme, we generated and analyzed mandibular development in Smoc/c;Hand2-Cre mice, in which Cre expressed from the Hand2-Cre transgene is activated in post-migratory neural crest cells in the distal halves of the mandibular and other pharyngeal arches (Ruest et al., 2003). By crossing the Hand2-Cre transgenic mice with the R26R-lacZ Cre reporter mouse line (Soriano, 1999) and analyzing LacZ activity in the R26R-lacZ;Hand2-Cre embryos, we confirmed that Cre expressed from the Hand2-Cre transgene starts to be active after E9.0 and is restricted in the mandibular and other pharyngeal arches (Figure 5—figure supplement 1). From E10.5 to E12.5, the Hand2-Cre lineage cells contribute to about the distal two thirds of the mandibular mesenchyme, including neural crest-derived mesenchyme in the developing tongue (Figure 5—figure supplement 1B–D,F–H), similar to previous findings (Ruest et al., 2003; Ruest et al., 2004). We then analyzed the effect of tissue-specific inactivation of Smo using the Hand2-Cre driver on the gene expression patterns in the distal mandibular arch mesenchyme. As shown in Figure 5, whereas expression of Bmp4 mRNAs was similarly restricted to the distal mandibular ectoderm in the Smoc/c control and Smoc/c;Hand2-Cre mutant embryos at E10.5 (Figure 5A,B), the pattern of expression of Msx1, Msx2, and Alx4, is each expanded to the oropharyngeal side of the distal mandibular arch mesenchyme in the Smoc/c;Hand2-Cre mutant embryos compared with the Smoc/c control embryos (Figure 5C–H). Furthermore, we found by immunofluorescent staining that phosphorylated Smad1/5/9 (pSmad1/5/9) positive cells exhibit a gradient distribution, with the highest level in the mandibular mesenchyme immediately underlying the Bmp4-expressing mandibular ectoderm and the lowest level at the pharyngeal side of the mandibular arch mesenchyme, in E10.5 control embryos, but the E10.5 Smoc/c;Hand2-Cre mutant embryos exhibited high levels of pSmad1/5/9 throughout the oral-aboral axis of the distal mandibular arch mesenchyme (Figure 5I–K). Smoc/c;Hand2-Cre embryos exhibit oropharyngeally expanded BMP signaling activity in the developing mandibular arch. (A–H) Whole mount in situ hybridization detection of Bmp4 (A, B), Msx1 (C, D), Msx2 (E, F), and Alx4 (G, H) mRNAs in the mandibular arches in E10.5 Smoc/c (A, C, E, G), and Smoc/c;Hand2-Cre (B, D, F, H) embryos (n = 3 for each genotype). (I, J) Immunofluorescent detection of phospho-Smad1/5/9 (pSmad1/5/9, red) on sagittal sections through the distal region of the mandibular arches in E10.5 Smoc/c (I) and Smoc/c;Hand2-Cre (J) embryos . Arrow points to oropharyngeal side and arrowhead points to aboral side of the mandibular arch. (K) Quantification of percentage of pSmad1/5/9 positive nuclei in the three domains along the aboral-oral axis of mandibular mesenchyme (domain1, domain2, domain3). Statistical analysis was performed on data from 22 sections of 4 embryos of each genotype by using two-way ANOVA. a, aboral, o, oral. *p<0.05, ***p<0.001. We further analyzed the phenotypic effects in the Smoc/c;Hand2-Cre mutant embryos. Skeletal preparations of E18.5 embryos showed that the Smoc/c;Hand2-Cre embryos had a shortened mandible but their skull and upper jaw were mostly unaffected, in comparison with the control littermates (Figure 6A,B). Histological analysis showed that the Smoc/c;Hand2-Cre embryos displayed severe defect in tongue formation although they had normal development of the nasal and upper jaw structures, including normal development of the secondary palate (Figure 6C,D). Similar to that reported in Smoc/n;Wnt1-Cre embryos (Jeong et al., 2004), Myf5-expressing tongue muscle precursor cells arriving at the mandibular arch in the E10.5 Smoc/c;Hand2-Cre embryos were significantly reduced compared with the control littermates (Figure 6—figure supplement 1A,B). At E15.5, the Smoc/c;Hand2-Cre mutant embryos displayed a cleft and rudimentary tongue in the pharyngeal region and absence of oral part of the tongue (Figure 6—figure supplement 1C–H). Analysis of expression of Runx2 and alkaline phosphatase on coronal sections showed that the Smoc/c;Hand2-Cre mutant embryos exhibited ectopic ossification in the oral side of the mandibular mesenchyme as early as E12.5 (Figure 6E–H). These results indicate that inactivation of Smo in the neural crest cells either prior to their migration into the mandibular arch, as in Smoc/c;Wnt1-Cre embryos, or after their arrival in the mandibular arch, as in Smoc/c;Hand2-Cre embryos, led to similar disruption of mandibular structures, including disruption of tongue formation and ectopic bone formation from the oral side of the mandibular arch mesenchyme. Together, these results indicate that hedgehog signaling in the neural crest-derived mandibular mesenchyme is crucial for inducing tongue formation and preventing osteogenic differentiation in the oral side of the developing mandible. Smoc/c;Hand2-Cre embryos display tongue agenesis and ectopic ossification. (A, B) Skeletal preparations of heads of E18.5 Smoc/c (A) and Smoc/c;Hand2-Cre (B) embryos (n = 5 for each genotype). Arrow in B indicates the shortened mandible in the Smoc/c;Hand2-Cre embryo. (C, D) HE staining of frontal sections of E16.5 Smoc/c (C) and Smoc/c;Hand2-Cre (D) embryos (n = 3 for each genotype). Asterisk in D marks absence of tongue in the Smoc/c;Hand2-Cre embryo. (E, F) Immunofluorescent detection of Runx2 (green) and muscle alpha-actin (red) on frontal sections of E12.5 Smoc/c (E) and Smoc/c;Hand2-Cre (F) embryos (n = 3 for each genotype). Sections were counterstained with DAPI. (G, H) Detection of alkaline phosphatase activity (blue) on frontal sections of E12.5 Smoc/c (G) and Smoc/c;Hand2-Cre (H) embryos (n = 3 for each genotype). Sections were counterstained with eosin. Arrowheads in F and H indicate the ectopic ossification at the oral side of the developing mandible. The condensed Meckel’s cartilage primordia are outlined using dashed lines in E-H. p, palate; t, tongue. The oropharyngeally expanded activation of pSmad1/5/9 and expression of the BMP targeted genes in the mandibular arch mesenchyme in Smoc/c;Hand2-Cre mutant embryos suggest that hedgehog signaling patterns the oral-aboral axis of the mandibular mesenchyme through antagonizing BMP signaling. To test this hypothesis further, we crossed Hand2-Cre transgenic mice with the R26SmoM2 mice, which carry a Cre-activatable transgene encoding a dominant active form of Smo (Jeong et al., 2004), and analyzed the effects of ectopic activation of Smo-mediated hedgehog signaling in the mandibular mesenchyme in R26SmoM2;Hand2-Cre mouse embryos. 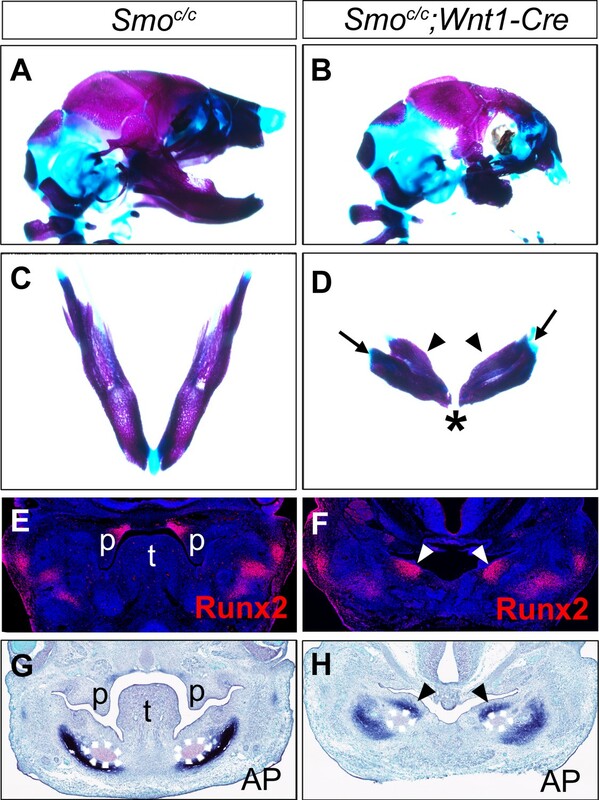 As shown in Figure 7, expression of Foxf1, a known direct transcriptional target gene downstream of hedgehog signaling (Hoffmann et al., 2014), is activated throughout the oral-aboral axis of the distal mandibular arch mesenchyme in E10.5 R26SmoM2;Hand2-Cre embryos, in comparison with the restricted expression of Foxf1 at the oropharyngeal side of the mandibular arch mesenchyme in control littermates (Figure 7A,B). Compared with the control littermates, expression of Msx2 and Alx4 in the distal mandibular arch mesenchyme is significantly reduced in the E10.5 R26SmoM2;Hand2-Cre mouse embryos (Figure 7C–F). Furthermore, immunofluorescent staining of sagittal sections of E10.5 embryos showed a significant decrease in the number of pSmad1/5/9 positive cells in the distal mandibular arch mesenchyme of E10.5 R26SmoM2;Hand2-Cre embryos compared with control littermates (Figure 7G–I). These results confirm that hedgehog-Smo signaling regulates BMP signaling pathway activation along the oral-aboral axis in the mandibular arch mesenchyme. Ectopic activation of Smo signaling inhibits BMP signaling activity in the mandibular arch mesenchyme. (A–F) Rostral views of the mandibular arches following whole mount in situ hybridization detection of Foxf1 (A, B), Msx2 (C, D), and Alx4 (E, F) mRNAs in the E10.5 R26SmoM2 (A, C, E), and R26SmoM2;Hand2-Cre (B, D, F) embryos (n = 3 for each genotype). Asterisks in A and B mark the aboral side of the mandibular arch. (G, H) Immunofluorescent detection of phospho-Smad1/5/9 (pSmad1/5/9, red) on sagittal sections through the distal regions of E10.5 R26SmoM2 (G) and R26SmoM2;Hand2-Cre (H) embryos (n = 3 for each genotype). Arrow points to oropharyngeal endoderm, and arrowhead points to mandibular ectoderm. (I) Quantification of the percentage of pSmad1/5/9 positive nuclei in the mandibular arch mesenchyme. Statistical analysis was performed on data from 18 sections of three embryos for each genotype by using Student’s t-test. #, p<0.001. Previous studies showed that blocking Smo-mediated hedgehog signaling causes increased apoptosis of the neural crest cells in the developing facial primordia in both chick and mouse embryos (Ahlgren and Bronner-Fraser, 1999; Hu and Helms, 1999; Jeong et al., 2004). The truncation of the maxillary and mandibular structures in Smoc/n;Wnt1-Cre mutant mice was partly attributed to increased apoptosis of neural crest cells in the mutant facial primordia at E9.5 to E10.5 (Jeong et al., 2004). We found that Smoc/c;Hand2-Cre mutant pups also exhibit significantly shortened mandible compared with control littermates (Figure 6A,B). We therefore analyzed cell apoptosis in Smoc/c;Hand2-Cre mutant embryos and their littermates using immunofluorescent detection of active Capase-3. Whereas no increase in apoptosis was detectable in E9.5 Smoc/c;Hand2-Cre embryos, we detected a group of cells with strong Caspase-3 activity specifically in the distal mandibular arch mesenchyme in E10.5 Smoc/c;Hand2-Cre embryos (Figure 8A,B). The increased apoptosis in the distal mandibular mesenchyme correlated with the distal truncation of both the dentary bone on the aboral side and the ectopic bone on the oral side of the mutant mandible (Figure 8E,F). Since we detected expanded activation of pSmad1/5/9 and Bmp4 target gene expression in the mandibular arch mesenchyme in the E10.5 Smoc/c;Hand2-Cre mutant embryos and since increased BMP signaling has been correlated with increased neural crest apoptosis in mouse embryos lacking both Noggin and Chordin, two endogenous antagonists of BMPs (Anderson et al., 2006; Stottmann et al., 2001), we investigated whether reducing the Bmp4 gene dosage could rescue mandibular morphogenesis in the Smoc/c;Hand2-Cre embryos. We found that the amount of active caspase-3 positive cells was significantly reduced in the mandibular mesenchyme of E10.5 Smoc/c;Hand2-Cre;Bmp4+/- embryos in comparison with Smoc/c;Hand2-Cre littermates (Figure 8B–D). By E18.5, 4 out of 5 Smoc/c;Hand2-Cre;Bmp4+/- mutants showed partial rescue of distal mandible and formation of the mandibular symphysis, in contrast to the lack of distal mandibular skeletal structures in the Smoc/c;Hand2Cre mutants (Figure 8F,G). However, the Smoc/c;Hand2-Cre;Bmp4+/- pups still showed tongue agenesis and duplication of the dentary bone on the oral side (Figure 8G). These results indicate that hedgehog signaling regulates mandibular arch mesenchyme survival and oral-aboral patterning through antagonizing BMP signaling. Smoc/c;Hand2-Cre embryos showed Bmp4-dependent increase in apoptosis of distal mandibular mesenchyme. (A–C) Immunofluorescent detection of active-Caspase3 (red) in E10.5 Smoc/c (A), Smoc/c;Hand2-Cre (B), and Smoc/c;Hand2-Cre;Bmp4+/- (C) embryos. Mandibles are outlined with white dash lines. (D) Quantification of active-Caspase3 positive cell density in the Smoc/c, Smoc/c;Hand2-Cre and Smoc/c;Hand2-Cre;Bmp4+/- samples. The results were presented as mean ± SD. Smoc/c (98.96 ± 28.21 cells/mm2); Smoc/c;Hand2-Cre (584.12 ± 275.20 cells/mm2); Smoc/c;Hand2-Cre;Bmp4+/- (280.45 ± 153.23 cells/mm2). Analysis was performed with one-way ANOVA followed by Tukey post hoc test to compare all pairs. #, p<0.001. (E–G) Skeletal preparations showing mandibles of E18.5 Smoc/c (E), Smoc/c;Hand2-Cre (F), and Smoc/c;Hand2-Cre;Bmp4+/- (G) embryos (n = 5 for each genotype). Arrowheads in F and G point to duplicated dentary bone. Asterisks in F and G mark differences in the morphology of the distal mandibular structure in Smoc/c;Hand2-Cre (F) and Smoc/c;Hand2-Cre;Bmp4+/- (G) embryos. Arrows in G point to the Meckel’s cartilage. It has been shown previously that hedgehog signaling regulates expression of several members of the Fox gene family, including Foxf1 and Foxf2, in the developing mouse facial primordia (Jeong et al., 2004). 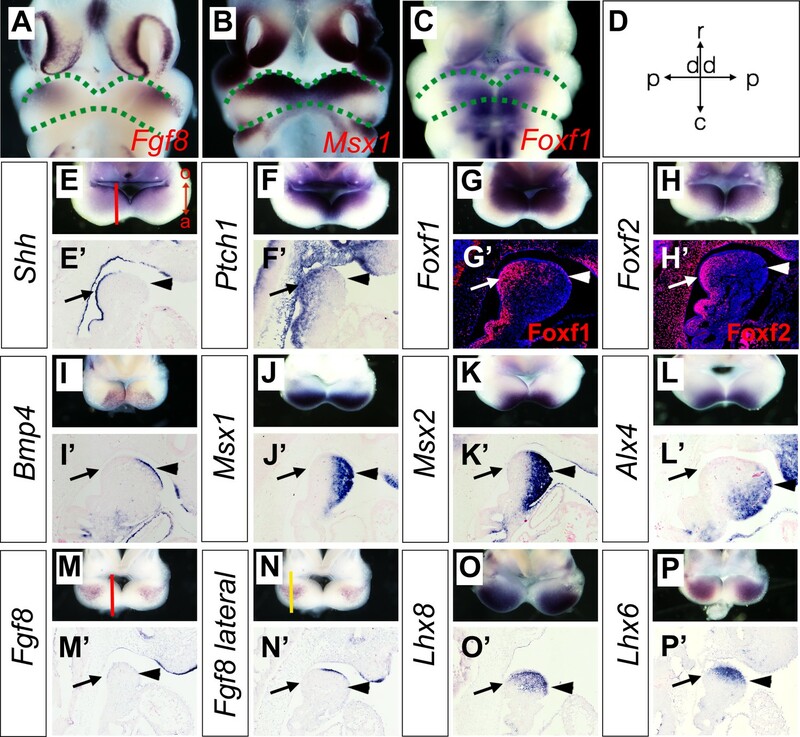 We found that expression of Foxf1 and Foxf2, as well as Ptch1 mRNAs, was dramatically reduced in the distal mandibular arch mesenchyme in E10.5 Smoc/c;Hand2-Cre embryos compared with their control littermates (Figure 9A–F). We recently showed that neural crest-specific inactivation of either Foxf1 or Foxf2 caused cleft palate but did not significantly affect mandible and tongue development (Xu et al., 2016b). We next tested the possibility that Foxf1 and Foxf2 act redundantly to mediate hedgehog signaling function in mandibular development by generating and analyzing Foxf1c/c;Foxf2c/c;Wnt1-Cre mouse embryos. Remarkably, we found that the Foxf1c/c;Foxf2c/c;Wnt1-Cre mouse embryos exhibited absence of the oral tongue and ectopic ossification at the oral side of the mandibular mesenchyme (Figure 9G–L), similar to Smoc/c;Wnt1-Cre (Figure 4E–H) and Smoc/c;Hand2-Cre (Figure 6E–H) embryos. In contrast to the severe truncation of distal mandibular skeleton in the Smoc/c;Wnt1-Cre (Figure 4B,D) and Smoc/c;Hand2-Cre (Figure 6B, Figure 8F) mutant pups, however, the E18.5 Foxf1c/c;Foxf2c/c;Wnt1-Cre mutant pups showed mandibular bone with nearly normal symphysis at the distal end and with a thin layer of ectopic bone formed at the oral side (Figure 9K,L). In addition, migration of the Myf5-expressing tongue muscle precursor cells to the E10.5 mandibular arch occurred normally in the Foxf1c/c;Foxf2c/c;Wnt1-Cre mutant embryos, similar to control littermates (Figure 9—figure supplement 1A,B) and unlike the Smoc/c;Hand2-Cre embryos (Figure 6—figure supplement 1B). Careful examination of muscular structures by immunofluorescent detection using serial sections of the E16.5 embryos showed that the Foxf1c/c;Foxf2c/c;Wnt1-Cre mutant embryos formed extensive extrinsic tongue muscles but only rudimentary intrinsic tongue muscles in the pharyngeal region (Figure 9—figure supplement 1C–H). We further examined pSmad1/5/9 activation in the mandibular arches in E10.5 Foxf1c/c;Foxf2c/c;Wnt1-Cre embryos and their littermates and found that the Foxf1c/c;Foxf2c/c;Wnt1-Cre embryos displayed expansion of pSmad1/5/9 activation to the oropharygeal side of the distal mandibular arch mesenchyme (Figure 10), similar to E10.5 Smoc/c;Hand2-Cre mouse embryos (Figure 5I–K). These results indicate that Foxf1 and Foxf2 are important mediators of hedgehog signaling function in the mandibular arch mesenchyme for tongue formation and for preventing ossification of the oral side mandibular arch mesenchyme. Foxf1 and Fox2 mediate Shh-Smo signaling function in mandible and tongue development. (A–F) Rostral views of the mandibular arches of E10.5 Smoc/c (A, C, E) and Smoc/c;Hand2-Cre (B, D, F) embryos following whole mount in situ hybridization detection of Ptch1 (A, B), Foxf1 (C, D), and Foxf2 (E, F) mRNAs (n = 3 for each genotype). Arrow points to the mRNA signals in the oral side of the mandibular arch. (G, H) Immunofluorescent detection of Runx2 (green) on frontal sections of E12.5 Foxf1c/c;Foxf2c/c (G) and Foxf1c/c;Foxf2c/c;Wnt1-Cre (H) embryos (n = 3 for each genotype). Sections were counterstained with DAPI. (I, J) Detection of alkaline phosphatase activity (blue) on frontal sections of E12.5 Foxf1c/c;Foxf2c/c (I) and Foxf1c/c;Foxf2c/c;Wnt1-Cre (J) embryos (n = 3 for each genotype). (K, L) Skeletal preparations showing mandibles of E18.5 Foxf1c/c;Foxf2c/c (K) and Foxf1c/c;Foxf2c/c;Wnt1-Cre (L) embryos. Arrowheads in H, J, and L point to ectopic ossification at the oral side of the mandible (n = 3 for each genotype). Asterisks in H and J mark the defective palatal shelves in Foxf1c/c;Foxf2c/c;Wnt1-Cre embryos. The Meckel’s cartilage primordia are indicated by white dashed circles in G-J. p, palate; t, tongue. Foxf1c/c;Foxf2c/c;Wnt1-Cre embryos exhibit oropharyngeally expanded BMP signaling activity in the developing mandibular arch. (A, B) Immunofluorescent detection of phospho-Smad1/5/9 (pSmad1/5/9, red) on sagittal sections through the distal region of the mandibular arches in E10.5 control (littermates that are Cre negative) (A) and Foxf1c/c;Foxf2c/c;Wnt1-Cre (B) embryos. Arrow points to oropharyngeal side and arrowhead points to aboral side of the mandibular arch. (C) Quantification of the percentage of pSmad1/5/9 positive nuclei in the three domains along aboral-oral axis of mandibular arch mesenchyme (domain1, domain2, domain3). Statistical analysis was performed on data from 28 sections of 5 control embryos and 33 sections of 5 Foxf1c/c;Foxf2c/c;Wnt1-Cre embryos by using two-way ANOVA. a, aboral, o, oral. ***p<0.001. Prior to this report, only Fgf8 signaling has been directly implicated in patterning the oral-aboral axis in vertebrates (Cobourne and Sharpe, 2003; Grigoriou et al., 1998; Tucker et al., 1999). Grigoriou et al. (1998) first showed by using frontal sections of E10.5 mouse embryos that expression of Lhx6 and Lhx8 (named Lhx7 in the original publication) mRNAs in the developing facial primordia was asymmetrically localized to caudal side of the maxillary processes and rostral side of the mandibular processes and that Fgf8, but not Bmp4 or Shh, was able to induce Lhx6/8 mRNA expression in E10.5 mouse embryonic mandibular mesenchyme explants in culture (Grigoriou et al., 1998). Tucker et al., 1999 showed that Fgf8 could not only induce Lhx6/8 expression but also repress expression of Goosecoid (Gsc), a homeobox gene normally expressed in the caudal side of the mandibular arch mesenchyme in E10.5 mouse embryos, in embryonic mouse mandibular explants (Tucker et al., 1999). Further studies showed that Fgf8-mediated repression of Gsc expression in the mandibular mesenchyme explants depended on induction of Lhx6/8, suggesting that Fgf8, normally expressed in the rostroproximal mandibular arch epithelium, patterns the rostral-caudal axis of the mandibular mesenchyme by inducing expression of Lhx6/8 in the rostral mandibular mesenchyme and secondarily restricting Gsc expression to the caudal mandibular mesenchyme (Tucker et al., 1999). Whereas these reports and subsequent review articles have equated the rostral-caudal axis of the mandibular arch as the same as the oral-aboral axis (Chai and Maxson, 2006; Cobourne and Sharpe, 2003; Grigoriou et al., 1998; Parada and Chai, 2015; Tucker et al., 1999), both our scRNA-seq data and our in situ hybridization data comparing the expression patterns of Fgf8, Lhx6, and Lhx8, with the expression patterns of the hedgehog pathway genes Shh, Ptc1, Foxf1, Foxf2, and the BMP pathway genes Bmp4, Msx1, Msx2, in the developing mouse mandibular arch (Figure 3) clearly demonstrate that the hedgehog and BMP pathway genes are expressed in a complementary pattern along the oral-aboral axis of the mandibular arch that is distinct from the rostral-caudal axis along which the Fgf8-Lhx6/8 gene pathway is activated. Furthermore, our data showing that conditional inactivation of Smo in either the early neural crest lineage or specifically in the post-migratory neural crest-derived distal mandibular arch mesenchyme led to agenesis of the oral tongue structure and duplication of the dentary bone. Although partial duplication of the dentary was reported previously in the Smoc/n;Wnt1-Cre mutants, most of the neural crest derived craniofacial bones were missing or severely hypoplastic in the Smoc/n;Wnt1-Cre mutants (Jeong et al., 2004) and the tissue source of the partially duplicated dentary was not investigated. We show that the duplicated dentary bone in the Smoc/c;Wnt1-Cre and Smoc/c;Hand2-Cre mutants form from ectopic ossification in the oral side of the mandibular arch mesenchyme and the ectopic dentary bone formation was preceded by expansion of BMP signaling activation into the oral region of the mandibular mesenchyme, demonstrating clearly for the first time that hedgehog signaling in the mandibular arch mesenchyme is required for patterning the oral-aboral axis of the mandible. Hedgehog signaling, particularly Shh signaling, has been shown to regulate a number of tissue patterning events during vertebrate development, including anteroposterior patterning of the limb, dorsoventral patterning of the neural tube, and dorsoventral patterning of somites (Briscoe, 2009; Ericson et al., 1997; Hirsinger et al., 1997; Ingham and McMahon, 2001; McMahon et al., 1998; Riddle et al., 1993; Tickle and Towers, 2017; Watanabe et al., 1998). In several of these developmental processes, Shh signaling regulates tissue patterning through antagonizing BMP signaling. During limb development, Shh signaling controls expression of Gremlin1, which encodes a BMP antagonist that is crucial for maintaining the apical ectodermal ridge and the Shh-Fgf4/8 positive feedback loop for limb outgrowth (Khokha et al., 2003; Zúñiga et al., 1999). In the developing neural tube, cells adopt distinct identities along the dorsoventral axis in response to Shh from the notochord and floor plate as well as to BMPs produced in the overlying ectoderm and roof plate (Ericson et al., 1997; Lee and Jessell, 1999). Whereas Shh signaling is essential for inducing ventral cell fates in the developing neural tube, studies of Noggin mutant mice showed that Noggin-mediated antagonism of BMP signaling is required for Shh-mediated ventralization of the spinal cord (McMahon et al., 1998). Similarly, during somite development, Noggin-mediated antagonism of BMP signaling is required for Shh-mediated induction and dorsoventral patterning of the sclerotomal cells (Hirsinger et al., 1997; McMahon et al., 1998). In this study, we found that expression of several downstream target genes of the hedgehog and BMP pathways are expressed in complementary patterns along the oral-aboral axis of the mandibular arch mesenchyme, which correlated with the complementary patterns of expression of Shh and Bmp4 in the distal mandibular arch epithelium. We found that expression of the BMP target genes, including Msx1, Msx2, and Alx4, expanded to the oropharyngeal side of the mandibular arch mesenchyme in the Smoc/c;Wnt1-Cre and Smoc/c;Hand2-Cre embryos. Furthermore, we found that pSmad1/5/9 was activated throughout the oral-aboral axis of the distal mandibular arch mesenchyme in Smoc/c;Hand2-Cre embryos, indicating that hedgehog signaling antagonizes BMP signaling pathway activation in the oropharyngeal side of the mandibular arch mesenchyme. We found that conditional deletion of Foxf1 and Foxf2, two of several Fox family genes with Smo-dependent expression in the mandibular arch mesenchyme (Jeong et al., 2004), partly recapitulated the mandibular patterning defects in Smoc/c;Wnt1-Cre and Smoc/c;Hand2-Cre embryos, including tongue agenesis and ectopic ossification in the oral side of the mandibular mesenchyme. 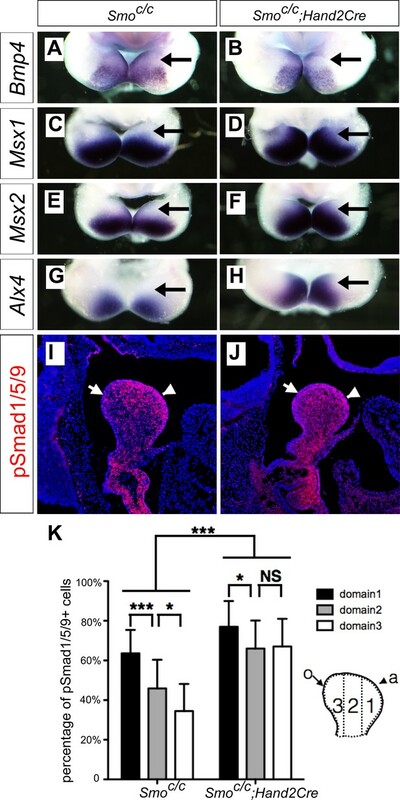 The Foxf1c/c;Foxf2c/c;Wnt1-Cre embryos also showed orally expanded activation of pSmad1/5/9 in the distal mandibular mesenchyme, indicating that these transcription factors act downstream of Shh signaling to pattern the oral-aboral axis through antagonizing BMP signaling. It has been shown that Foxf2-/- mutant embryos had increased pSmad1/5 and decreased pSmad2/3 in the developing brain tissues (Reyahi et al., 2015). Another report showed decreased pSmad2/3 in the developing secondary palate in Foxf2-/- mouse embryos (Nik et al., 2016). However, how Foxf1/2 regulates Smad activity is not known. 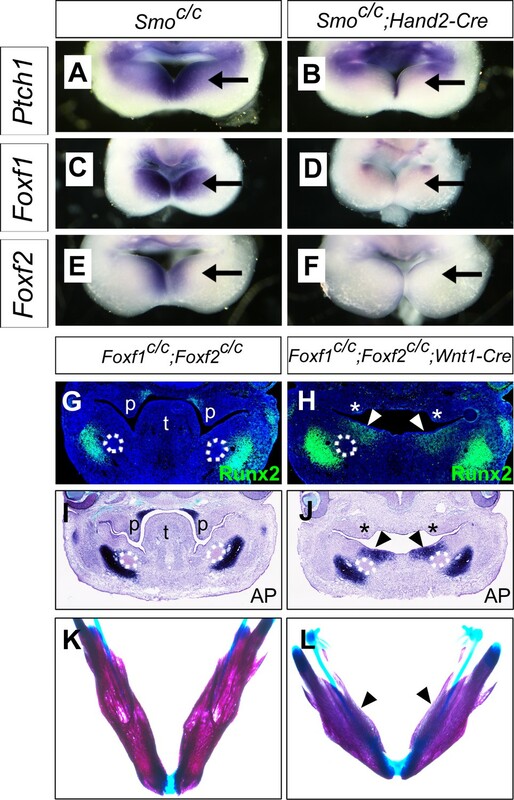 None of these Fox family transcription factors have been shown to mediate Shh signaling function in anteroposterior patterning of the limb or dorsoventral patterning of the neural tube or somite. Thus, whereas antagonistic interactions of Shh and BMP signaling are crucial in patterning multiple tissues, the exact molecular mechanisms mediating hedgehog signaling induced antagonism of BMP signaling are context-dependent and the detailed molecular mechanism mediating hedgehog signaling function in oral-aboral patterning and its antagonism of BMP signaling in the developing mandibular arch requires further investigation. Previous studies have shown that BMP signaling is crucial for proximal-distal patterning of the mandibular arch (Liu et al., 2005). In particular, Bmp4 acts in a dose-dependent manner to restrict Fgf8 expression to the proximal mandibular arch epithelium (Liu et al., 2005). In addition, BMP signaling is required for activation of expression of Hand1 in the distal cap mesenchyme of the mandibular arch through interacting with the Hand2 transcription factor, whose expression in the distal mandibular mesenchyme is activated by the Dlx5/6 transcription factors in response to endothelin-1 signaling (Charité et al., 2001; Depew et al., 2002; Vincentz et al., 2016). It has been shown that Hand2-mediated feedback down-regulation of Dlx5/6 in the distal mandibular mesenchyme is essential for both BMP-mediated activation of Hand1 expression and for initiation of tongue morphogenesis (Barron et al., 2011; Vincentz et al., 2016). In addition, multiple signaling pathways, including TGF-beta, FGF, and Wnt, are involved in the interactions between the mandibular neural crest mesenchyme and tongue muscle precursor cells to regulate migration, proliferation, and differentiation of the myoblasts to organize into specific tongue muscles (Parada and Chai, 2015). We show that the tongue agenesis in the Smoc/c;Hand2-Cre mutant embryos was preceded by reduced accumulation of Myf5-expressing myoblasts in the mandibular arch at E10.5, suggesting that hedgehog signaling in the neural crest cells is crucial for regulation of myoblast migration into the mandibular arch during tongue initiation. On the other hand, Myf5-expressing tongue precursor cells migrated normally to the mandibular arch in Foxf1c/c;Foxf2c/c;Wnt1-Cre embryos, but these mutant embryos still had severe disruption of tongue formation, suggesting that the Shh-Fox pathway acts in the mandibular neural crest mesenchyme to regulate multiple steps of tongue morphogenesis. How Shh-Foxf1/2 mediated antagonism of BMP signaling along the oral-aboral axis interacts with the BMP-Hand1/2-Dlx5/6 pathways in the distal mandibular mesenchyme to specify the distinct domains for proper tongue and dentary bone formation will require further investigation. Although this study has not directly addressed which hedgehog ligand is required for patterning the oral-aboral axis of the mandibular arch, all available evidences indicate that Shh is the patterning signal in this process. Of the three mouse genes encoding hedgehog family ligands, only Shh has been shown expressed in the developing mouse mandibular arch prior to E10.5 (Billmyre and Klingensmith, 2015; Jeong et al., 2004). The tongue agenesis and ectopic ossification at the oral side of the mandibular mesenchyme in the Smoc/c;Wnt1-Cre and Smoc/c;Hand2-Cre embryos correlate well with the restricted expression of Shh in the oropharyngeal epithelium. Furthermore, it has been shown that tissue-specific inactivation of Shh in the oropharyngeal epithelium in mouse embryos led to tongue agenesis, distal truncation and severe hypoplasia of the mandible, which mimic the mandibular defects in the Smon/c;Wnt1-Cre and Smoc/c;Hand2-Cre mice (Billmyre and Klingensmith, 2015; Jeong et al., 2004). 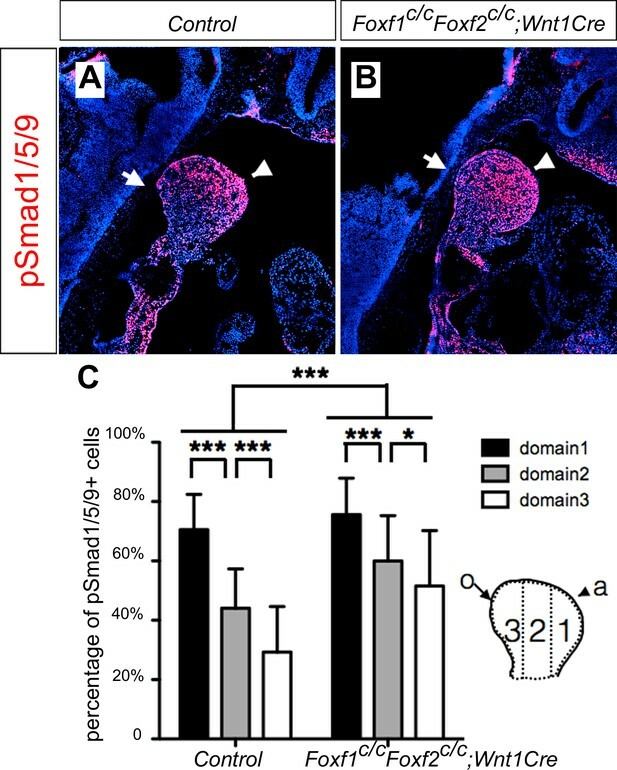 Together, these data indicate that Shh ligands produced in the oropharyngeal epithelium signal through Smo in the mandibular mesenchyme to antagonize BMP signaling and pattern the oral-aboral axis of the mandibular arch. Previous studies have indicated that Shh signaling plays a crucial role in the survival of neural crest-derived craniofacial mesenchyme (Ahlgren and Bronner-Fraser, 1999; Billmyre and Klingensmith, 2015; Jeong et al., 2004). Mouse embryos with either neural crest-specific deletion of Smo or oropharyngeal epithelium-specific deletion of Shh caused dramatically increased apoptosis of the mandibular arch mesenchyme cells (Billmyre and Klingensmith, 2015; Jeong et al., 2004). Billmyre and Klingensmith showed that pharmacological inhibition of p53 reduced apoptosis of the mandibular arch mesenchyme caused by loss of Shh signaling (Billmyre and Klingensmith, 2015). However, how loss of function of Shh-Smo signaling triggers p53-mediated apoptosis in the mandibular arch mesenchyme is unknown. In this study, we found that the significantly increased apoptosis of the distal mandibular arch mesenchyme in the Smoc/c;Hand2-Cre embryos correlated with the increased BMP signaling, and that reduction in Bmp4 gene dosage significantly reduced apoptosis of the distal mandibular arch mesenchyme in Smoc/c;Hand2-Cre;Bmp4+/- embryos. These results indicate that Shh regulates neural crest survival in the mandibular arch at least in part through antagonizing BMP signaling. Hayano et al., 2015 showed that ectopic activation of BMPR1A signaling in cranial neural crest cells caused a significant increase in p53 protein levels and induced p53-mediated apoptosis (Hayano et al., 2015). Taken together, these data indicate that Shh-Smo signaling regulates mandibular mesenchyme survival through antagonizing BMP signaling and preventing BMP-induced p53-mediated apoptosis. In addition to crucial roles in cell survival and growth of the mandibular mesenchyme, Shh has previously been implicated in regulating development of Meckel’s cartilage (Billmyre and Klingensmith, 2015; Brito et al., 2008). Tissue-specific deletion of Shh in the oropharyngeal epithelium caused complete lack of Meckel’s cartilage formation in the mutant mouse embryos (Billmyre and Klingensmith, 2015). Conversely, ectopic expression of Shh in the mandibular arch ectoderm of early chick embryos resulted in formation of ectopic cartilage branching off from the endogenous Meckel’s cartilage (Haworth et al., 2007). Moreover, grafting of Shh-producing quail embryonic fibroblasts in the presumptive proximal mandibular arch in chick embryos induced formation of two supernumerary Meckel’s cartilages that develop in a mirror-image to the endogenous one (Brito et al., 2008). However, whereas both Smoc/c;Wnt1-Cre and Smoc/c;Hand2-Cre embryos exhibit distal truncation of the mandibular skeleton, Meckel’s cartilage formed in these mutant embryos. Jeong et al., 2004 showed that the Smoc/n;Wnt1-Cre embryos also developed Meckel’s cartilage, albeit distally truncated. Moreover, we found that the Smoc/c;Hand2-Cre;Bmp4+/- embryos developed Meckel’s cartilage and the cartilage symphysis in the distal region of the mandible. These results indicate that Shh either directly regulate Meckel’s cartilage formation through a Smo-independent mechanism or indirectly regulate Meckel’s cartilage formation through signaling in another cell type in the mandibular arch. It has been shown that exogenous Fgf8 was able to rescue Meckel’s cartilage formation in embryonic mouse mandibular explant cultures treated with the hedgehog antagonist cyclopamine (Melnick et al., 2005). In mouse embryos with oropharyngeal epithelial deletion of Shh, Fgf8 expression in the proximal mandibular arch epithelium was significantly reduced in comparison with control littermates (Billmyre and Klingensmith, 2015). Induction of supernumerary Meckel’s cartilage formation in the chick mandibular arch by an extra source of Shh in the presumptive mandibular arch ectoderm was preceded by induction of ectopic expression of Fgf8 and Bmp4 in the caudal side of the mandibular arch ectoderm (Brito et al., 2008; Haworth et al., 2007). Taken together, these data indicate that Shh signaling regulates mandibular growth and patterning through at least two distinct mechanisms: (1) Shh signals to adjacent mandibular arch ectodermal cells to regulate expression of Fgf8 to control mandibular growth and Meckel’s cartilage development, and (2) Shh signals directly through Smo in the neural crest-derived mandibular mesenchyme cells to regulate their survival and oral-aboral patterning through antagonizing BMP signaling. The Smoc/c, R26SmoM2, Foxf1c/c, Foxf2c/c, Wnt1-Cre, and Hand2-Cre mice have been described previously (Bolte et al., 2015; Danielian et al., 1998; Jeong et al., 2004; Ren et al., 2014; Ruest et al., 2003). The Hand2-Cre mice were maintained by crossing with C57BL/6J mice. Wnt1-Cre mice were maintained by crossing with CD1 (Charles river) mice. Smoc/c, R26SmoM2, Foxf1c/c and Foxf2c/c mice were maintained by intercrossing homozygotes. Noon of the day a vaginal plug was identified was designated as embryonic day (E) 0.5. Only littermate control embryos were used in each experiment. No masking was used during group allocation, data collection and/or data analysis. No data was excluded in this study. This study was performed in strict accordance with the recommendations in the Guide for the Care and Use of Laboratory Animals by the National Institutes of Health. The animal use protocol was approved by the Institutional Animal Care and Use Committee of Cincinnati Children’s Hospital Medical Center (Permit Number IACUC2016-0095). A psychrophilic protease protocol for single cell dissociation was modified from previous report (Adam et al., 2017). Mandibles from E10.5 wildtype CD1 mouse embryos were rapidly dissected in ice-cold PBS. Five embryonic mandibles were pooled in a sterile 1.5 ml microcentrifuge tube with 350 µl of freshly made protease solution containing 5 mg/ml of Bacillus Licheniformis protease (Sigma P5380) in DPBS, 5 mM CaCl2, and 125 U/ml DNase (Applichem A3778). The sample was incubated in 4°C for a total 8 min, with trituration for 15 s every 2 min using a 1 ml pipet. Single cell dissociation was confirmed by observation of samples under microscope. Following inactivation of the protease with ice-cold DMEM containing 10% FBS, the cells were pelleted by centrifugation at 1200 g for 5 min. The cells were resuspended in 1 ml ice-cold DMEM containing 10% FBS, and filtered through a sterile 40 μM filter (BD Falcon 352340) and pelleted by centrifugation at 1200 g for 5 min. The dissociated cells were washed with ice-cold DMEM containing 10% FBS. Cell number and viability were analyzed using a hemocytometer following trypan blue (Gibco 15250061) staining. The single cell preparation displayed greater than 90% viability in this experiment. The single cell suspension was adjusted to 900 cells/µl and approximately 14,000 cells were loaded onto a well on a 10x Chromium Single Cell instrument (10x Genomics). Barcoding, cDNA amplification and library construction were performed using the Chromium Single Cell 3’ Reagent Kits v2 exactly according to the manufacturer's instructions. This system uses the 10x GemCode technology that partitions thousands of cells individually into nanoliter-sized Gel Bead-In-Emulsions (GEMs), where cell lysis and cDNA synthesis occur, with all cDNAs generated from an individual cell sharing a common cell specific barcode. Unique Molecular Identifier (UMI) barcodes, specific for each oligonucleotide on a bead, allow compression of data to hybridization events, reducing amplification bias. Post cDNA amplification reaction and cleanup were performed using SPRI select reagent (Beckman Coulter, Cat# B23318). Post cDNA amplification and post library construction quality analyses were performed using the Agilent Bioanalyzer High Sensitivity kit (Agilent 5067–4626). The final single cell 3’ library contains standard Illumina paired-end constructs (begin and end with P5 and P7 primer sequences, and 16 bp 10x Barcode, 10 bp UMI, Read one primer sequence, Read two primer sequence, and the 8 bp i7 sample index. Libraries were sequenced using an Illumina HiSeq 2500 and the paired-end 75 bp sequencing flow cell. Sequencing parameters used were: Read 1, 27 cycles; i7 index, eight cycles; Read 2, 147 cycles, according to manufacturer’s recommendations, which produced about 300 million reads. The sequencing output raw data were processed using CellRanger 2.0.0 (http://10xgenomics.com) to obtain a gene-cell data matrix. Once the gene-cell data matrix was generated, poor quality cells were excluded through cell filtering by selecting cells that expressed >1000 unique genes, with each gene expressed in a minimum of three cells. Only one read per cell was needed for a gene to be counted as expressed. Cells containing high percentages of mitochondrial (>10%), histone (>0.002%), or hemoglobin (>0.01%) genes were excluded. The resulting gene expression matrix was normalized to 10,000 molecules per cell and log transformed according to Macosko et al. (Macosko et al., 2015). The top 593 genes with the highest variability among cells were found using Seurat’s FindVariableGenes function, x.low.cutoff = 0.0125, x.high.cutoff = 4, y.cutoff = 0.5. These highly variable genes were used for principal components (PCs) analysis using the Seurat package (version 2.0.1, R 3.4.1 library). The influence of the number of unique molecular identifiers was minimized using Seurat’s RegressOut function. Clustering was performed with Seurat’s t-distributed stochastic neighbor embedding (tSNE) implementation using the first 18 significant PCs determined by JackStraw plot (Macosko et al., 2015). All clustering was unsupervised, without driver genes. Cell groupings were determined by shared nearest neighbor (SNN) using the Louvain algorithm. The tSNE maps visualized the single cells on two-dimensional or three-dimensional space based on expression signatures of the variable genes. Marker genes were determined for each cluster using Seurat’s FindAllMarkers function using the Wilcoxon rank sum test, only considering genes expressed in a minimum of 25% of cells and fold change threshold of 1.3. Over/under clustering was verified via gene expression heatmaps. Monocle-2 (Qiu et al., 2017) was used for analysis of developmental trajectories of the neural crest cell population. The raw UMI gene counts were used and modeled on the negative binomial distribution using genes that were expressed in a minimum of 10 cells. The BEAM function was used to determine genes enriched in each trajectory state. The scRNA-seq data from this study have been deposited into the National Center for Biotechnology Information Gene Expression Omnibus (NCBI GEO) database (accession number GSE112837). For histological analysis, embryos were dissected at desired stages from timed pregnant mice, fixed in 4% paraformaldehyde (PFA), dehydrated through an ethanol series, embedded in paraffin, sectioned at 7 μm thickness, and stained with alcian blue followed by hematoxylin and eosin. Detection of alkaline phosphatase was performed on frozen sections. Briefly, the sections were washed with NTMT (0.1 M NaCl, 0.1 M Tris-HCl pH 9.5, 50 mM MgCl2, 0.1% Tween20) buffer, then stained with NBT/BCIP Substrate Solution at 37°C. Immunofluorescent staining of paraffin sections was performed following standard protocols. Three embryos of each genotype have been used for the experiment. Antibodies used were: rabbit Anti-Runx2 (Santa Cruz, sc-10758), Goat anti-Foxf1 (R&D Systems, AF4798), and sheep anti-Foxf2 (R&D Systems, AF6988). Anti muscle actin antibody (Clone HUC1-1) (Sawtell and Lessard, 1989) was provided by Dr. James Lessard (Cincinnati Children’s Hospital Medical Center). Immunofluorescent staining of pSmad1/5/9 (Cell Signaling, #13820) was performed on frozen sections following standard protocol with modifications. The number of pSmad1/5/9 positive nuclei over the total DAPI positive nuclei was recorded as percentage of pSmad1/5/9 positive cells using Nikon NIS-Elements AR software (Nikon). The mandibular mesenchyme was divided into three domains along the oral-aboral axis, and percentage of the pSmad1/5/9 positive cells was quantified in each domain, and for each genotype. The results were presented as mean ± SD. Statistical analysis was performed using two-way ANOVA followed by Bonferroni post-test to compare data from all domains. For SmoM2;Hand2-Cre mutants and control samples, the percentage of the pSmad1/5/9 positive cells throughout the oral-aboral axis of the distal mandibular mesenchyme on sagittal sections were quantified and statistical analysis was performed using Student’s t-test. P value less than 0.05 was considered significant. The quantification of cleaved Caspase3 signal was perform in Smoc/c, Smoc/c;Hand2-Cre and Smoc/c;Hand2-Cre;Bmp4+/- embryos. Whole mount immunofluorescent staining of E10.5 mandible tissues was performed as previously described using rabbit anti-cleaved Caspase3 (BD Pharmingen, 559565) (Xu et al., 2016a). Immunostained samples were scanned by confocal microscopy using a Nikon A1 Inverted Microscope. Four embryos of each genotype, and 10–20 sections from each embryo were used for quantification. In total, 69 sections from Smoc/c, 54 sections from Smoc/c;Hand2-Cre, and 69 sections from Smoc/c;Hand2-Cre;Bmp4+/- embryos were used for quantification. The results were presented as mean ± SD. Statistical analysis was performed with one-way ANOVA followed by Tukey post hoc test to compare all pairs. P value less than 0.05 was considered significant. X-Gal staining of whole mount embryos and cryostat sections was performed as previously described (Hogan, 1994). Sections were counterstained with eosin. Skeletal preparations were performed as previously described (Martin et al., 1995). Whole mount and section in situ hybridization was performed as previously described (Zhang et al., 1999). At least three embryos of each genotype were hybridized to each probe and only probes that detected consistent patterns of expression in all samples were considered as valid results. Journal of Biological Chemistry 290:7563–7575. Developmental origins and evolution of jaws: new interpretation of "maxillary" and "mandibular"
Archives of Oral Biology 48:1–14. Cold Spring Harbor Symposia on Quantitative Biology 62:451–466. Plainview NY: Cold Spring Harbor Laboratory Press. Oxford New York: Clarendon Press; Oxford University Press. Annual Review of Neuroscience 22:261–294. Archives of Oral Biology 32:123–127. Current Topics in Developmental Biology 115:31–58. The Journal of Cell Biology 109:2929–2937. Frontiers in Cell and Developmental Biology 5:14. Current Opinion in Cell Biology 13:698–705. Thank you for submitting your article "Sonic hedgehog signaling patterns the oral-aboral axis of the mandibular arch" for consideration by eLife. Your article has been reviewed by four peer reviewers, including Shahragim Tajbakhsh as guest Reviewing Editor, and the evaluation has been overseen by Didier Stainier as the Senior Editor. The following individuals involved in review of your submission have agreed to reveal their identity: Ramkumar Sambasivan (Reviewer #1). This study reports on the role of Hedgehog signalling in the patterning of the oral-aboral axis in the mouse developing jaw. The authors use scRNAseq and identify genes in distinct cell populations in the mandibular arch and map these subsets in the embryo using in situ hybridisation. Using several genetically modified mouse models, the authors propose that hedgehog signaling antagonizes Bmp signalling in the presumptive osteogenic domain, which is critical for cell survival in the distal mandibular arch. The work complements the current understanding of FGF8 / BMP4 antagonism in patterning the proximo-distal axis of jaw, the experiments are well-designed and the extensive phenotypic data represents a significant advance in the field. 1) The presentation of scRNAseq data is not well integrated and the analysis appears preliminary. Additional analysis would enable the authors to support their conclusions, and would make the article more accessible to a wider readership. 2) Are the subdivisions of the mandibular arch sharply defined or extremes of expression gradients? In the in situ hybridizations, many genes show graded expression, and the authors also mention the presence of nested spatial expression patterns (subsection “Single-cell RNA-seq analysis of the E10.5 mouse mandibular arch”, third paragraph). It is not clear why the authors choose to represent the complex 3D organization of the mandibular arch with a simple 2D tSNE projection, and why they look for distinct clusters instead of analyzing expression gradients. Indeed, the genes shown in Figure 2 do match the four clusters shown in Figure 1B only in some cases. Some of the genes demarcate parts of these clusters (e.g. pou3f3, foxf2) or span subparts of multiple clusters (e.g. lhx8, covering part of cluster 0 and 3). Moreover, it is not evident why 3 stands as its own cluster: the heatmap in Figure 1C does not show genes specific of this cluster. The dataset seems rich enough to characterise and display more clearly the three major spatial axes of the developing mandibular arch: oral-aboral, proximo-distal and rostro-caudal. The authors could explore computational methods better suited for this, for example PCA, ICA or diffusion maps. In this way the three axes might show up as separate components in PCA, ICA and/or diffusion map space. This would enable the authors to study the cells along "pseudospace" trajectories, and to plot more clearly the expression of genes with graded and nested expression along these axes. They should also identify in an unbiased way the gene families overrepresented along these axes (e.g. by GO-enrichment), and leverage their data further to support the main conclusions (e.g., are there genes involved in ossification vs. muscle differentiation activated at the two opposite extremes?). 3) The increased apoptosis found in the distal region of mandibular arch at E10.5 in Hand2Cre;Smoc/c may be responsible for the lack of distal mandibular skeletal structure at newborn stage. It would be helpful to discuss or speculate on the potential cellular mechanism that resulted in the ectopic dentary bone formation in Smo mutant mice. 4) The authors attribute the NC3 population from the single cell RNA-seq to a population of neural crest cells which underwent an incomplete lysis of their nucleus, thus clustering out of the NC1 and NC2 clusters. However it is considered that nuclear transcripts represent a small fraction of cellular transcripts, and that nuclear mRNA is a good substitute for cellular mRNA in scRNAseq cell type identification (Lake et al., Sci Rep, 2017). Could the lack of nuclear transcripts alone account for the clustering of this population ? Among the nuclear lncRNA, Sox11 seems to be highly differentially expressed in NC3 compared with NC1/2. Sox11 is known to be expressed in the palate 3 days later, as well as in nerves. Could this population come from a proximal contamination from a domain shared with the maxillary prominence or neurogenic cells in the mandible ? 5) The authors present a model of an oral endodermal Shh expression, leading to an activation of Foxf1/2 in the adjacent mesenchyme and inhibition of BMP4 signalling, controlling the expansion of the Msx1 domain. - Importantly, do the authors observe an expansion of p-SMAD1/5/9 in the Wnt1-Cre; Foxf1/2 cKO? - If so, can the authors speculate on the possible targets of Foxf1/2, leading to the inhibition of Smads? 6) The authors describe tongue agenesis in Wnt1-Cre;Smo cKO, Hand2-Cre; Smo cKO and Wnt1-Cre; Foxf1/2 cKO, but show only rostral frontal sections. - Is tongue agenesis observed all along the oral rostro-caudal axis in the different cKO specimens? - Do the authors have available data at E10.5 showing altered hypoglossal cord formation in cKO specimens? - From the data collected in this study, the authors should discuss more extensively the role of the neural crest-derived population during tongue morphogenesis as previously proposed and reviewed in Parada and Chai (2015). We thank the editors and reviewers for providing suggestions for re-analysis of our scRNA-seq data. For this manuscript revision, we have greatly expanded analysis of the scRNA-seq data using multiple methods and report the results in the first two figures in the manuscript body plus 8 supplementary figures, 7 supplementary tables, and a supplementary video for 3D tSNE projection. We re-wrote the Results section to report these new analyses and results. The results not only support the conclusions of the manuscript but also provide seamless and logical transition from the scRNA-seq analysis to our extensive mechanistic genetic studies in the rest of the manuscript. We have re-analyzed the scRNA-seq data and replaced Figure 1B and Figure 1C with new results. Instead of always reducing the tSNE dimensions to two, we have analyzed 3-dimensional tSNE projections. Although tSNE plots usually would show clusters of cell types arranged in a manner that is completely unrelated to their in vivo spatial relationships, our new iterative clustering analysis of the mandibular arch neural crest scRNA-seq data resulted in grouping the neural crest cells into six clusters that are distributed along three major spatial axes in a 3D tSNE projection, including the previously defined proximal-distal and rostral-caudal axes and the new experimentally validated oral-aboral axis (the new Figure 1B and Figure 1—video 1). This is probably because the extensive nested patterns and gradients of gene expression across the mandibular arch neural crest cell population provided abundant intermediate connecting cell types, resulting in a 3D tSNE projection that recapitulated the cellular distribution of the in vivo spatial organization. Thus, although the clusters do not have sharp boundaries and do not match most of the individual gene expression domains, they represented the patterns of cellular distribution along the major spatial axes at high resolution, with each cluster marked by multiple highly differentially expressed marker genes (new Figure 1C and Supplementary file 3). Unlike the original Figure 1B and Figure 1C, there is no discrepancy between the clustering tSNE projection in the new Figure 1B and the heatmap presented in Figure 1C. The new analysis results generated the main hypothesis regarding Hedgehog and BMP signaling in patterning the oral-aboral axis that was tested through extensive genetic studies reported in the rest of the manuscript. Thus, the expanded tSNE analysis, particularly with the use of 3D tSNE projection, significantly improved our decoding and interpretation of the scRNA-seq data and provide crucial support for the conclusions of the manuscript. In the revised manuscript, we discuss the limitation of the tSNE clustering with mostly nonexclusive marker genes. We also revised Figure 2 to show direct comparisons of representative marker gene expression profiles in the tSNE plots with in vivo expression patterns detected by whole mount in situ hybridization. Moreover, we also performed principal component analysis as well as developmental trajectory analysis (using Monocle 2) of the scRNA-seq dataset, as suggested, but neither methods allowed clear identification of spatial patterns of the neural crest derived mandibular arch mesenchyme, most likely due to the fact that most of the E10.5 mouse mandibular mesenchyme cells are highly proliferating undifferentiated progenitor cells that have extensive overlapping transcriptome profiles. We present the PCA and trajectory analyses results in Figure 1—figure supplement 5-8, and additional GO analysis results in Supplementary files 4-7. Our data presented in Figure 8 agree with the hypothesis that increased apoptosis in the distal region of the mandibular arch may be responsible for the lack of distal mandibular skeletal structures at the new born stage and showed that decreasing BMP4 gene dosage partly rescued distal mandibular skeletal structures. Together with the other data presented in this manuscript, we conclude that BMP signaling is crucial in patterning the oral-aboral axis as well as in hedgehog mediated mandibular mesenchymal survival. The original manuscript already included a paragraph discussing the mechanism involving BMP signaling in regulating mandibular mesenchyme survival. We regard the ectopic dentary bone formation as a secondary consequence of loss of the oral fate and disruption of oral-aboral patterning of the mandibular mesenchyme (Discussion, first paragraph). We agree that the nuclear transcripts represent a fraction of cellular transcripts and nuclear mRNA is a good substitute for cellular mRNA in scRNA-seq cell type identification. We have expanded the analysis comparing the NC3 cluster with all other clusters and show that NC3 cluster cells showed significantly reduced overall transcripts and the number of genes expressed per cell than all other clusters (new Figure1—figure supplements 2 and 3). Furthermore, we show by tSNE plots that NC3 cluster cells had very low or absence of ubiquitously highly expressed nuclear lncRNAs (new Figure1—figure supplement 4). Since we do not know what percentage of the total cellular transcripts are nuclearly localized in the E10.5 mandibular mesenchyme cells, we do not know whether lack of nuclear transcripts alone could account for the clustering of the NC3 population. However, the low overall transcripts and number of expressed genes detected per cell, together with the unique lack of nuclear lncRNAs highly expressed in other cell clusters, strongly suggest that the NC3 cells were incompletely lysed and revised our interpretation to “these data suggest that the NC3 cluster resulted most likely from incomplete lysis of a subset of single cells”. We also show in Figure1—figure supplement 4 that Sox11 expression is obviously lower in NC3 cell than in the other clusters. Thus, it is unlikely for NC3 to be due to contamination from the maxillary prominence. To our knowledge, this finding of failure of nuclear lysis in a subset of cells in scRNA-seq is new and should be of use to the single cell analysis community. We have performed new experimental analysis as requested and present the pSmad1/5/9 data in the Foxf1/2 cKO embryos in the new Figure 10. Indeed, our new data show that the Foxf1/2 cKO embryos had orally expanded activation of pSmad1/5/9 in the mandibular arch mesenchyme (new Figure 10). We also added a brief discussion of possible mechanisms involving Foxf1/2 mediated regulation of the Smads in the Discussion section (second paragraph). We have analyzed the tongue structures using serial sagittal and frontal sections in the Smo cKO and Foxf1/f2 cKO mutant embryos. We used immunofluorescent detection of muscle actin to label the tongue muscles. The anterior two-thirds of the tongue are located in the oral cavity, which arise from the mandibular arch, whereas the posterior third, known as the pharyngeal part, is derived from the third branchial arches. We found that all the mutant samples exhibited severe tongue defects, with only rudimentary tongue tissue in the posterior pharyngeal part but lack the oral part of the tongue tissues (Figure4—figure supplement 1 and Figure 6—figure supplement 1). In the Foxf1c/c;Foxf2c/c;Wnt1Cre embryos, the remaining muscular structures extend to more anterior region, but we didn’t detect outgrowth or protrusion of the oral tongue structures (Figure 9—figure supplement 1). It has been shown that Myf5-expressing tongue muscle precursor cells migrate from the occipital somites into the developing mandibular arch along the hypoglossal cord by E10.5 and significantly reduced number of Myf5-expressing muscle precursor cells accumulated at the midline of the mandibular arch in E10.5 Smoc/n;Wnt1Cre mutantembryos (Jeong et al., 2004). We performed Myf5 whole mount in situ hybridization in Smoc/c;Hand2Cre and Foxf1c/c;Foxf2c/c;Wnt1Cre embryos and compared with their control littermates. Myf5-expressing tongue muscle precursor cells were dramatically decreased in the mandibular arch in E10.5 Smoc/c;Hand2Cre embryos (Figure 6—figure supplement 1A-B), similar to that reported for Smoc/n;Wnt1Cre mutantembryos. In the Foxf1c/c;Foxf2c/c;Wnt1Cre embryos, however, the Myf5-expressing tongue muscle precursor cells accumulated normally in the mandibular arch by E10.5 (Figure 9—figure supplement 1A-B) but formation of the oral tongue was still severely disrupted. These results further support that Foxf1/2 plays a major role in mediating hedgehog-dependent specification of the oral fate of the neural crest-derived mandibular arch mesenchyme. We have added a brief discussion about the Shh-Foxf1/2 pathway in patterning the mandibular neural crest cells and secondarily affecting tongue formation, citing Parada and Chai (2015) (Discussion, third paragraph). We thank Dr. James Lessard at Cincinnati Children’s Hospital Medical Center for generously providing the anti muscle antibody (Clone HUC1-1). This work was supported by National Institutes of Health/National Institute of Dental and Craniofacial Research grant DE027046 and by Shriners Hospitals for Children grant #85900 to RJ. Animal experimentation: This study was performed in strict accordance with the recommendations in the Guide for the Care and Use of Laboratory Animals by the National Institutes of Health. The animal use protocol was approved by the Institutional Animal Care and Use Committee of Cincinnati Children's Hospital Medical Center (Permit Number IACUC2016-0095). © 2019, Xu et al.